Wow, this was an eye opener. 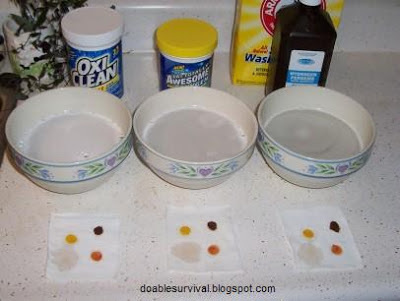 There are many many sites talking about making home-made Oxy-Clean and how cheap it is and how great it works, but I decided to do my own test and share the results. 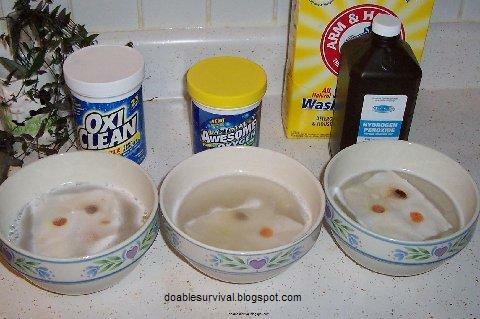 Turns out, the home-made Oxy-Clean is NOT cheaper. It's not better either, in my opinion. I think it came in close behind it though. 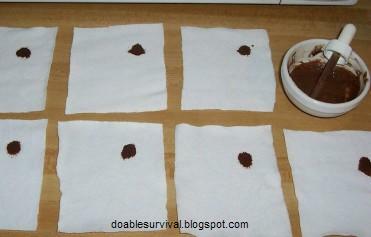 ...so if you need some in a pinch and don't have any, go ahead and whip up a small batch. I wanted to be thorough and as accurate as possible, so I used a dropper to be sure each stain had the same amount in it, soaked them the same amount of time, and rubbed them the same amount of time each. I was careful, also, to measure out how much was recommended for each product and used 1/4 since I was just doing a test in a small bowl. 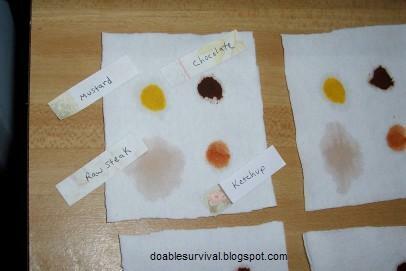 Chocolate, mustard, ketchup, and (blood) raw steak drippings. Ding ding ding! 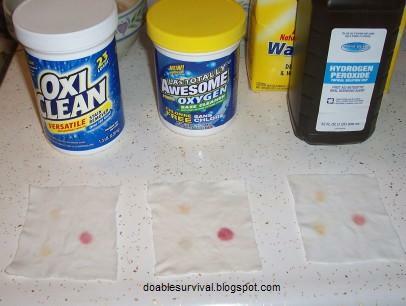 In this corner... DIY Oxy-Clean... "dollar store" version... name brand Oxy-Clean. The results: (Note, I made sure the stains set well as I didn't actually want them to get the stains completely out as I wouldn't be able to compare them then.) They all took the chocolate out. 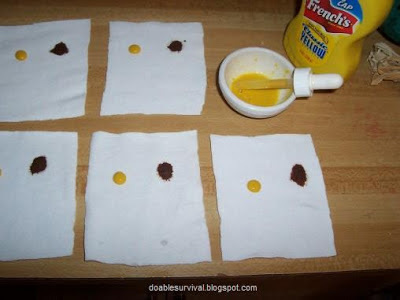 Oxy-Clean won on the mustard and steak drippings by a little. Ketchup was won by the home-made version, by a hair. Kind of weird how they made the ketchup stains look. Looks like food coloring. To me, it comes down between buying the original (best price-wise also) or making the DIY version. 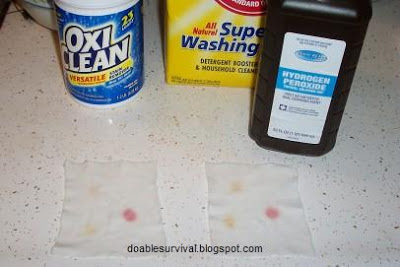 The washing soda was $3.24 at Wal-Mart and the hydrogen peroxide is around 90 cents, so it came out to .395 cents per use. 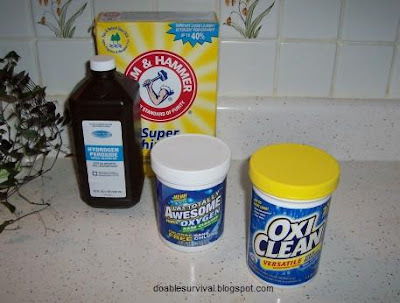 The Oxi-Clean was $3.86, so it came out to .26 cents per use. The Dollar Store version was, well, $1.00, duh. It came out to .07 cents per use. In Summary: Stain-wise, my personal impression is that the brand name is the best. The home-made version came in close behind, and the dollar store version was worse. Price-wise, the brand name Oxy-Clean wins. I've heard people rave about the DIY version and $ store version, so I'm sure people will disagree; but that's ok. I'm just going by my own experience and sharing. Coming Soon! 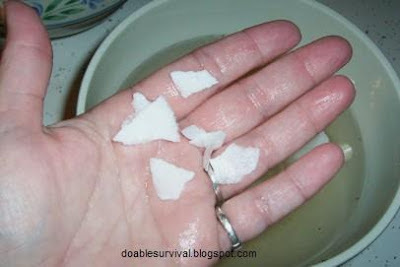 DIY Shout and home-made laundry detergent. You answered alot of questions for me! Thank you. What percent of hydrogen peroxide did you use? It could make a difference. I have 35 percent food grade for the "the 3 minute cure". I'm going to try that. It doesn't say anything on the front. On the back, it says "Hydrogen Peroxide (stabilized) 3%." Are you able to buy unscented oxyclean? I can't, so the homemade version is the only one available to me.